White Widow is a hybrid strain that many have been familiar with since the early 90’s. 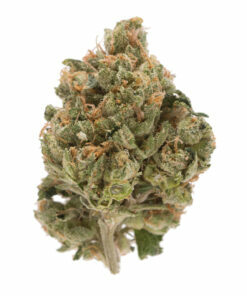 White Widow strain has global popularity and can easily be found atop a menu at almost any Amsterdam coffee shop. The prevalence of White Widow has greatly increased due to the television show Weeds and references within the rap industry. White Widow weed holds a pretty balanced 60:40 sativa/indica ratio ( Brazil Sativa x South Indian Indica) that leads one to a cognitive driven high with a relaxing undertone. Patients will opt for White Widow if they’re seeking a strain that allows them to unwind and relax while still maintaining a sense of mental awareness. White Widow Strain is especially good for depression, stress, pain, and PTSD. White Widow gets its name from the fact that it is literally blanketed in white crystals. Beware though, this sweet sugary smoke starts out light but expands dramatically which can lead to heavy coughing; especially if you’re a novice smoker. When it comes to smell, you can expect citrus and peppery scent that is accompanied by a lemony aftertaste. This strain is perfect for outdoor activities like hanging out at the beach or taking a nice walk.